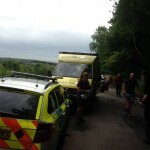 We were called by Police about a young walker who had suffered a seizure on the path just up from Overbeck Car Park. A team doctor attend and provided casualty care. GNAA paramedics also attended the scene. The young lady was then carried down to the car park by stretcher and taken to hospital. We were called by Police about a couple with a dog reported to be cragfast somewhere on the steep ground between Black Crag and Scafell. Whilst we were making our way to the scene they were helped off by members of the public and we stood down. 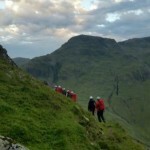 The team was called out for a walker who had tumbled on the steep descent from Kirkfell down to Wasdale and damaged his ribs. 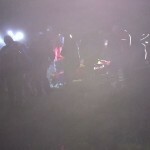 He was treated by team doctors before being taken by stretcher down to the valley. A short video clip of the stretcher run this afternoon. 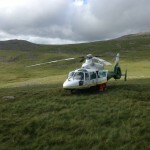 We were called by NWAS about a walker located on the main Scafell Pike path just above Lingmell Col who had aggravated a previous knee injury and could no long walk. 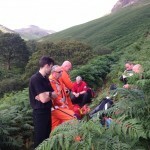 GNAA also attended and the injured man was helped to hobble around 200m down to the waiting aircraft then flown down to Wasdale. 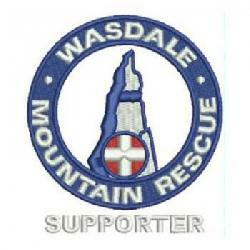 The team was called out to assist NWAS carry a patient out of Woodend Quarry near Egremont. 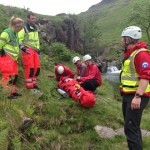 A team doctor also attended to provide casualty care. 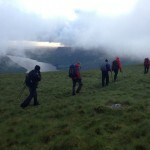 The second callout was to a gentleman with a hip injury on Great Gable, above Beck Head. 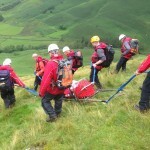 Thanks to Cockermouth Mountain Rescue Team who assisted on the carry to Beck Head and then took the casualty down to Black Sail Hut whilst we descended to Wasdale.